Fizi, an adult male bonobo at Lola ya Bonobo Sanctuary in the Democratic Republic of the Congo. A new study of these African apes hints at how human cooperation came to be. Credit: Christopher Krupenye, Duke University. Never trust anyone who is rude to a waiter, advice columnists say. For most people, acting nasty is a big turnoff. But while humans generally prefer individuals who are nice to others, a Duke University study finds bonobos are more attracted to jerks. The researchers were surprised by the findings because these African apes—our closest relatives in the animal kingdom along with chimpanzees—have been shown to be less aggressive than chimps. The results support the idea that a tendency to avoid individuals who mistreat others is one of the things that make humans different from other species. Even infants as young as three months old show an ability to distinguish nice guys from creeps, and prefer interacting with people they see helping others over those who are mean, previous studies show. 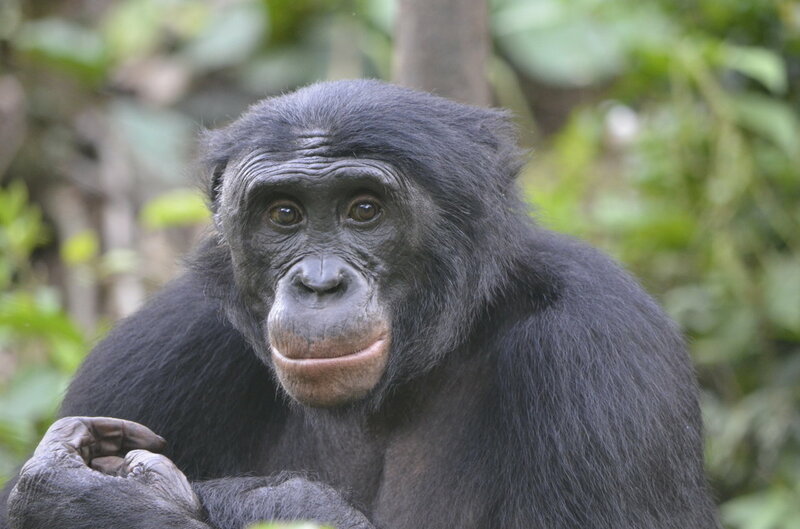 To find out if our closest relatives share the same social bias, Duke's Brian Hare, an associate professor of evolutionary anthropology, and doctoral student Christopher Krupenye studied adult bonobos at Lola ya Bonobo Sanctuary in the Democratic Republic of Congo. In one series of trials, they showed 24 bonobos animated videos of a Pac-Man-like shape as it struggles to climb a hill. Then another cartoon shape enters the scene. Sometimes it's a helpful character who gives the Pac-Man a push to the top, and other times it's an unhelpful one who shoves him back down. Afterwards, the researchers offered the bonobos two pieces of apple, one placed under a paper cutout of the helpful character and another under the unhelpful one, and gauged the bonobos' preference by watching to see which one they reached for first. The researchers also measured the apes' baseline preferences for each of the people in the stuffed animal skit at the beginning of the experiment, before the drama with the toy unfolded. The bonobos liked the mean people even more after they started behaving badly. 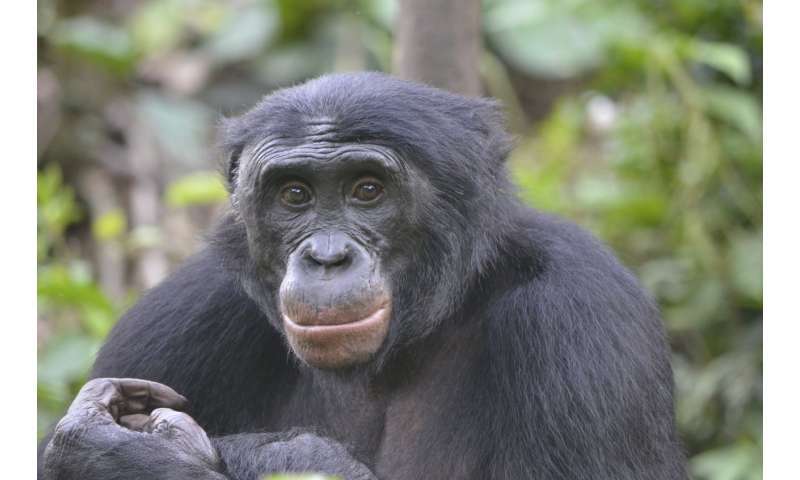 For bonobos, schmoozing with dominant individuals could mean better access to food, mates or other perks, or less chance of being bullied themselves, Krupenye said. The fact that bonobos prefer bullies and humans don't suggests that an aversion to jerks is a fundamental aspect of human behavior that may be unique to our branch of the primate family tree. In humans, the thinking goes, shunning wrongdoers not only helps people avoid bad partners, but also discourages wrongdoers from behaving badly in the first place. The threat of social rejection keeps them in check. Scientists say this bias may be what enables humans to work together in large numbers—even with complete strangers—in ways that other species do not. "Humans might have this unique preference for helpers that is really at the heart of why we're so cooperative," said Krupenye, now a postdoctoral fellow at the University of St Andrews in Scotland. The results appear online January 4 in the journal Current Biology.